I strive to convey the realistic beauty of form. This realism, whether I’m working in portrait, landscape or still life, is not defined by faithfully duplicating every detail. Rather, I render an artistic reality through composition, ambiance, selective details and brush strokes. I adhere to the 19th century Realism tradition, and paint from life as much as possible without using photos. I seek to represent the aesthetics of each chosen subject and present the audience with a vivid image. The beauty of the images arises not from perfection, but from an individual and unique reality. I am particularly interested in portrait painting and narrative painting. My narrative paintings have both contemporary and historic themes. Narrative paintings on contemporary subjects sharpen my observation and understanding of the people and social themes around me. Historic paintings challenge me to have a deeper understanding of the subject’s psychological profile in a particular situation at a specific moment in time. My narrative paintings often have a tinge of melancholy. Tragic characters and their life stories move me; they motivate me to explore their inner stage, their sorrows, struggles and emotions. Gestures and facial expressions captivate me and intrigue the audience. The process begins with inspiration; the scene and story unfold in my imagination. I conduct extensive research, then sketch ideas, create the study on canvas and finally paint on canvas. My research makes the painting more authentic and convincing, and includes field trips, the study of history and artifacts, and hiring models to pose as characters in the composition. This process can take years. Painting to me is an enjoyment. It is also endless pursuit of artistic achievement. 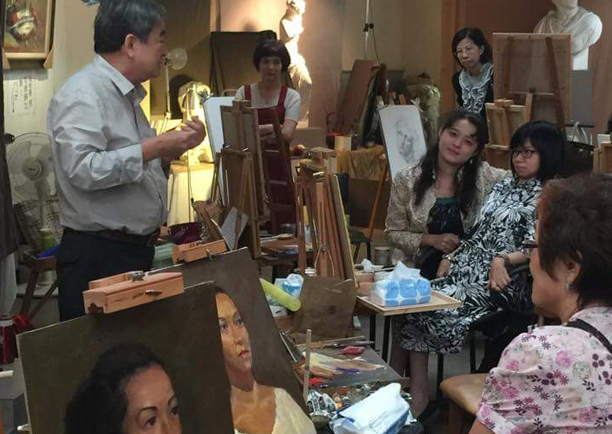 My painting and teaching career has spanned five decades, and I’m continuously experimenting with new ways of expression and approaches for realistic art. I am elated when I make a new discovery. Through painting, I strive to leave a legacy of artistic images. Watching the good-natured, graceful, and fatherly Yim Maukun (b. 1942) in his Twin Bridge art studio happily interacting with his students or in one of his instructional videos, it is hard to imagine that this is the same man who was publicly denounced and so viciously beaten for his class affiliations during the Cultural Revolution in China. Many of his works did not survive the chaos of those years, and obviously not all of his friends and associates did either. It was not a congenial time to be a student of such “bourgeois” fields as the fine arts, so closely associated with the cultural imperialism of the Western world on one hand and the exploitative decadence of the Chinese aristocracy on the other. 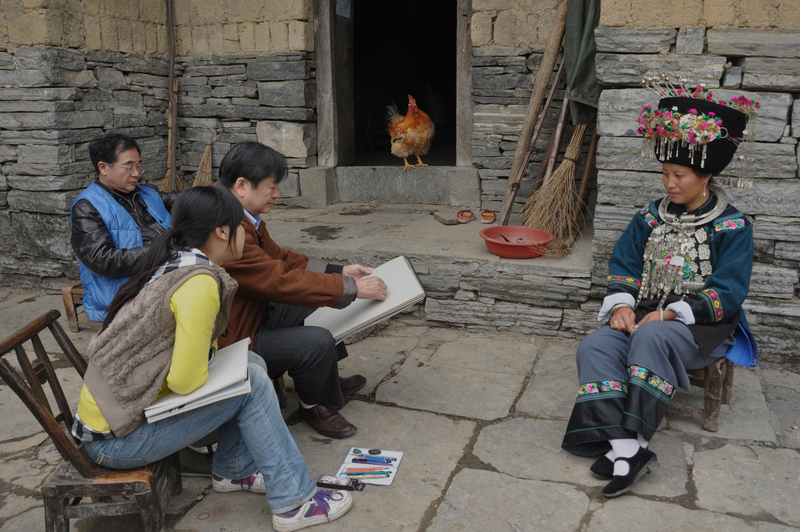 Even though Yim’s creativity may have been stunted in the 1960s and early 1970s and forcibly directed to serve the worker’s movement and the political interests of the state. He nevertheless found a sanctuary in painting then as he does now. It is true that the insanity of history can make us embrace art and cherish its purity all the more. 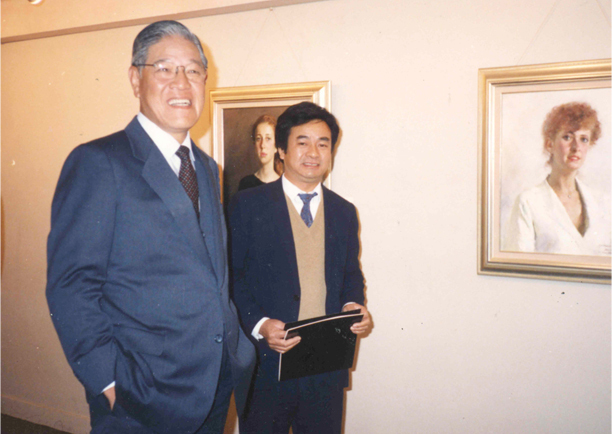 Thankfully, Yim managed to endure that tumultuous period; if anything, his talent even seemed to grow stronger for it, compelled as he was to adapt to the harsh winds of political change and to navigate a very narrow path to “success” in communist China, with all its governmental restrictions and bureaucratic vagaries. 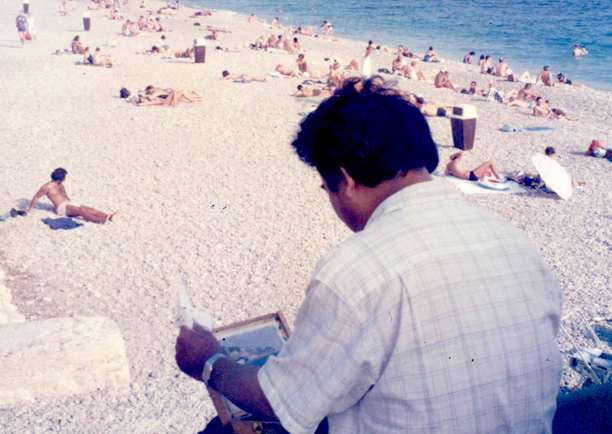 He went from laboriously painting tiny portraits of Chairman Mao on photographic slides and creating backdrop scenery for regional propagandistic theater productions for the better part of fifteen years to showing prize-winning pieces like The Troupe Going Aboard (1975) and Warrior Song (1978) at major exhibitions in Beijing and Guangzhou. Yim Maukun eventually would emigrate to Hong Kong and then Taiwan in the 1980s, but the influence of the PRC does remain evident in his style, so informed by Russian and Soviet Realism, with its careful attention to detail and technique. At the same time, however, in his portrait there is a sensitivity to the human face and the spirit within that also evokes Impressionism and transcends the medium itself. It is a realism that strives to express the soul within the form, and for that purpose is not afraid of using thicker brush strokes or textures, or experimenting with what he calls “the language of colors.” In amazingly subtle ways, Yim conjures immortal life out of those oils and somehow raises the dead with charcoal and pencil or whatever is at hand. There is beauty and intrigue throughout his work, as shown in the remarkable Lady in Shimmering Light (2002) and Girl with Bronze Bracelet (2001), both winners of international portrait competitions. The best word for it, perhaps, is simply depth: in the slightest glance or apparently most minor element of one of his compositions, there is simply so much depth and power to be discovered. It does not seem to be a coincidence that so many of Yim’s subjects possess a rather mysterious serenity and gentle confidence, much like the artist himself. 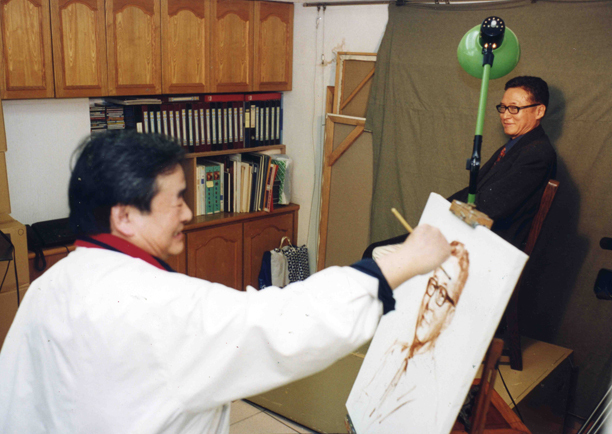 A major turning point in Yim’s career came in 1987 with a plein air portrait demonstration at the Apollo Gallery in Taipei. 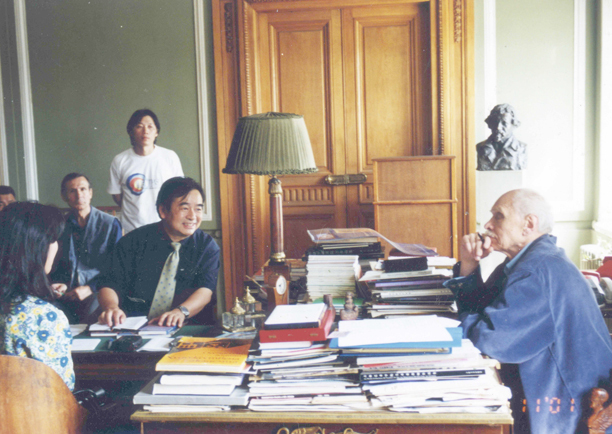 This received substantial media coverage and wide acclaim, drawing the attention (and quickly soon after the patronage) of many prominent figures of Taiwanese society, including then Vice President Lee Teng Hui and the writer/historian Li Ao, one of Taiwan’s foremost public intellectuals and political commentators. 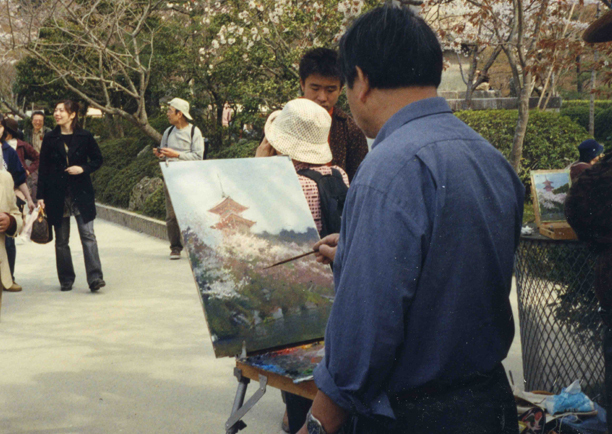 The success that followed the Apollo demonstration opened doors for Yim not just as a painter but also as an author and art educator, both as a teacher at his own studio and in visiting instructor positions at universities in Taiwan and mainland China. Accordingly, Yim’s portrait of Sun Yat-sen hangs in Sun Yat-sen Memorial Hall in Taipei, a rare national honor and perhaps the highest distinction a Taiwanese artist could receive. As his life story suggests, Yim is no stranger to drama, and that experience and perspective informs his grand narrative works. These are based particularly on poignant episodes from Chinese and Taiwanese history, and are large in scale, often taking several years to complete. As a narrative artist, he favors stories of trailblazers (such as the Buddhist monk Xuanzheng in Sunset in the West or the missionary George Leslie Mackay in multiple paintings), reformers (e.g., Emperor Guangxu and Consort Zhen) and fellow émigrés (as in the epic Crossing the Stormy Strait and Reaching Shore), often captured in moments of the highest possible tension. More surrealist mythological pieces like Nuwa have this quality as well. But Yim is equally adept at conveying in contemporary scenes the dramatic tension of everyday romance and the gravity to be found in simple, ordinary moments as in Hot Corn, Westside Evening, and Breaking Up. Over the last three decades Yim Maukun has also made the world his subject, traveling extensively throughout Europe, North America, and Asia. This has resulted in a wealth of portraits as well as a series of plein air landscape paintings for which he has gained renown. More travels and continents await, as Yim explores new places and meets new people, his paint-box and brushes always in hand. 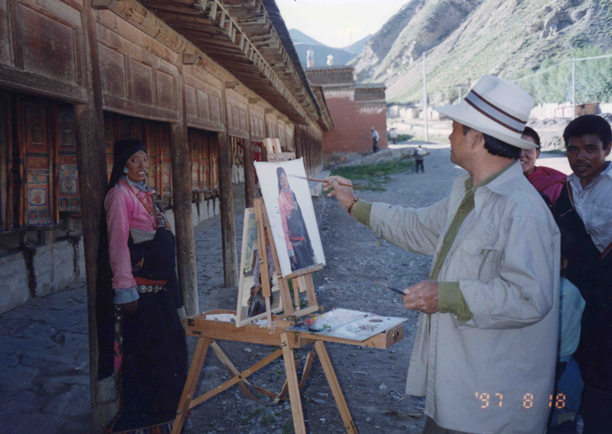 Now a grandfather, Yim has entered his sunset years with uncommon vigor and creative energy, actively producing new paintings and drawings, books, video lessons, and more, while continuing to impact the lives of students and art lovers everywhere. 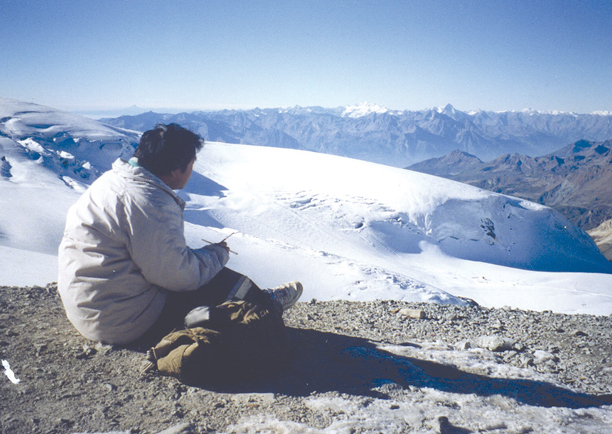 His memoir, Yim Mau-Kun, The Art and The Life, will be published by Guangxi Fine Arts Press in 2017. Thank you for visiting. Leave us a message.